Last night, President Obama announced he's acting on immigration and deportation policy, to keep families intact, which will affect the same 40 percent of undocumented immigrants here. Congress is soon to be run completely by Obama's opposition party. What will they do in response? There are a lot of possible answers to that question, but very far down on the list would be "pass a bill which Obama can sign." That was never going to happen -- it wouldn't have happened if Obama hadn't acted, it wouldn't have happened before the end of the year, it wouldn't have happened next year with a new Congress. And now it is definitely not going to happen. Nothing has changed on that front. What is different is that this time Obama realizes this fact. Ever since his re-election, Obama has been coming around to the position that Republicans in Congress are simply not good-faith negotiators, because no matter what deal he hammers out with John Boehner, Boehner can never produce the votes from within his caucus to pass such a deal. So Obama has largely stopped banging his head against this brick wall. Instead, he is setting the agenda in Washington in a breathtaking way. Since the midterm election, Obama has come out strongly for net neutrality, sealed the first deal that China has ever agreed to on curbing emissions, and now he's announced a new immigration and deportation policy which will affect the lives of millions of families for the better. Republicans react to each of these presidential announcements, but they have already lost all the momentum they gained in their midterm electoral victory. Instead of setting the agenda themselves, on their own terms, they are reduced to reactionary moves each time Obama acts. The one thing for certain: nobody's arguing whether Obama is "relevant," the way they normally do at the start of a president's seventh year in office. Obama is more relevant than ever. In fact, if the tough negotiations don't fall apart this weekend, Obama may have a new treaty which curbs Iran's nuclear ambitions as early as next Monday to announce, as well (this is a longshot, admittedly). Obama is rolling out new initiatives by the week, and Republicans have been caught flatfooted. Obama's move on immigration was certainly provocative, in the literal sense of "provoking a reaction." His speech was short and to the point, and he tossed down a few gauntlets in front of congressional Republicans, defying them to act on their own. He knows full well they won't, because their leaders cannot control the wilder factionalists within their ranks. "Pass a bill," Obama challenged, secure in the knowledge that they won't be able to. This is because Republicans don't have a policy of their own. As a party, they cannot agree on what America should do to solve the immigration problem. About the only thing they come close to agreeing on is to "secure the border," but the House can't even get its act together to pass a bill which does that. Obama has now shifted the debate to what should be done about the 11 million undocumented immigrants who are already here -- a subject the Republicans aren't even close to agreeing on any particular plan or action. Self-deportation? Round everyone up and ship them back to their country of origin? Allow them to stay and work, but never become citizens? A path to citizenship? Anything? Republicans have no plan -- they don't even have a bad plan, they simply have nothing. The biggest question hanging over Washington right now is how crazy the Republican response is going to be. The Republican leaders are desperately trying to head off any radicals from making odious and offensive statements in public, but my guess is they won't be successful in this effort. It won't take long before some Republican officeholder somewhere says something incredibly offensive, at least if recent history is any guide. What else (other than exposing their extremism on the issue) will Republicans attempt to do? Well, there's always the "shut down the government in a temper tantrum" route. Again, Republican leaders are desperately trying to nip this knee-jerk action in the bud, as well as any even-more-extreme reactions (like impeachment). "We're suing him in court!" John Boehner offers up to the Tea Party, but that may not be red enough meat for them, at the end of the day. The redder the meat for Tea Partiers, though, the more it looks to the middle-of-the-road American like nothing short of petulance and whining. Rather than attempting to set their own agenda in Congress next year, Republicans will be consumed with rage, caught in a loop of reacting to President Obama's actions. Obama's gutsy move on immigration places the issue front and center, right at the earliest beginnings of the 2016 presidential campaign. An issue the Republicans would have much preferred to merely issue platitudes and bromides about will now have to be addressed in a lot more detail. If Republicans hate Obama's plan so much, then what are they for, instead? What would they do differently? What is their solution to the problem? Instead of being able to dodge the tough questions, Republicans (especially those contemplating a run for the White House) are going to have to come up with real answers to those questions, for better or for worse. If Obama had failed to act, this would not have been true. Let's see... was there any one Democrat who stood out in any particular way this week? We are joking, of course. Because this week belonged to President Barack Obama. Obama decided to provide some leadership in an area sorely needing some, he decided to do what he thought was right, and he decided that he had had enough of the warnings of political implications of his action. What happens next is anyone's guess, but in one way or another this will be one of the more notable weeks of his entire presidency. Later, looking back, both historians and average Americans will put immigration reform within the top three most meaningful policies Obama ever achieved (the health care law and saving the economy from ruin would likely be the other two). Whether you are cheering Obama's action or howling in disagreement, you have to admit this is a big deal. We're in the cheering section, just to be clear. Which is why there are absolutely no other candidates this week for our Most Impressive Democrat Of The Week award. President Obama just made the lives of millions of American families a lot better. The question of which party is more friendly to the wants and needs of Latino voters is now crystal clear. The question of which political party still has racist elements within it and actively works against the hopes of Latinos is about to also be definitively answered. President Obama could have taken his midterm defeat hard, and begun another round of "offering a hand to the other side" (only to have it slapped down, once again). He chose not to do so, this time. He chose to chart his own course. Which will indeed be remembered in the future, one way or another. For his bold and gutsy action on immigration and deportation policy this week (and for introducing it in one of the snappiest speeches he's ever given on any subject), Obama is hereby awarded his forty-fourth Most Impressive Democrat Of The Week. Stay strong, Mister President. We're pretty sure that Obama will see some defections in the ranks on his new immigration policy. There will doubtless be a handful of senators and representatives from deep-red (and mostly-white) districts who will see a bigger political benefit to opposing Obama's new plan. But, so far, we're unaware of any who have jumped in front of television cameras to do so. Partly this was due to Obama's timing -- he announced his new plan right after all of Congress had gone home for the Thanksgiving holiday (because they're so special, they all get to take an extra week off to celebrate). This greatly diminished the immediate reaction. But, like we said, we're pretty sure it'll happen. Since it hasn't yet, we are not going to award a Most Disappointing Democrat Of The Week this week. No other Democrats were notably disappointing this week (on other subjects), and it's too early to see if some Democrats are going to be disappointing on immigration reform. So, for now, no MDDOTW award. As always, if you think someone obvious was ignored, let everyone know about it in the comments. President Obama already made the moral case for taking action, in his speech (which I wrote about last night, in a "snap reaction" column on Obama's speech). He laid out the reasons why he thought what he did was both imperative and the right thing to do. He directly challenged Republicans to "pass a bill" if they disagreed with him, knowing they will likely be incapable of doing so both for the rest of this year and in the new Congress next year. Democrats interested in taking this high moral road and explaining their support for the president in such terms have no further to look than the text of Obama's speech, in fact. Which is why we're taking a slightly different tack for today's talking points. Because while Obama is free to take the high moral road, other Democrats are going to have to fight in the political arena, where such tactics aren't going to be sufficient to match Republican wrath at (as they now call him) "Emperor Obama." So here are some suggestions for how Democrats should make the political case to support Obama's actions. These can be used by both politicians on a Sunday morning television chatfest, or by Americans who have to go home for Thanksgiving and argue politics with Cousin Earl or Uncle Jasper. Enjoy, and use responsibly, as always. Americans United For Change really deserves a lot of credit for digging this one out, and for how fast off the mark they got their new ad out. "On the subject of immigration, allow me to quote President Ronald Reagan. [Pause for a few seconds.] OK, was that enough time for conservatives to properly genuflect? Didn't want to interfere with anyone's religious practices, there. Saint Ronnie was speaking about one of his favorite metaphors -- the 'shining city on a hill' -- and he said the following (and I quote): 'I've spoken of a shining city, all my political life... in my mind it was a tall, proud city... and if there had to be city walls, the walls had doors. And the doors were open to anyone with the will and the heart to get here.' Americans United For Change has a great new ad up contrasting Reagan's statements with Obama's speech, in fact. So I'd like to ask you, point-blank: do you support what Ronald Reagan said, or not?" This one's not as snarky, but it's probably the best historical parallel to draw, for obvious reasons. "In 1990, President George H. W. Bush used his executive power to defer deportations to keep family members together. His action affected forty percent of undocumented immigrants in the country at that time. This week, President Barack Obama did exactly the same thing for exactly the same reason -- Congress wouldn't act. Obama, like Bush, is deferring deportation for family members of legal residents. Obama, like Bush, is acting solely within his executive responsibility. Obama, like Bush, will better the lives of exactly the same percentage of undocumented immigrants -- forty percent of them. At the time, however, nobody -- Democrat or Republican -- threw a temper tantrum and started using words like 'king' or 'emperor' to describe Bush. Democrats in Congress actually passed the bill Bush wanted, and the problem was resolved. Why is what Obama just did any different than what Bush did? Why are conservatives reacting differently now then they did then? Forty percent is forty percent, folks." I'm surprised more of the media have to be reminded about this one -- it wasn't all that long ago, after all. "Remember George W. Bush's administration? They certainly weren't shy about deciding which laws passed by Congress they were going to change or ignore. All you have to do is to do a web search on 'unitary executive' or 'signing statement' along with Bush's name, and you'll find hundreds of instances where Bush and Vice President Cheney strenuously argued that what the president did within the executive branch was simply not the business of Congress or the courts -- because, according to them, that's what the Constitution intended. All the media would have to do, really, is go back a decade and start searching for what Republicans had to say at the time about the 'unitary executive' theory. You'll find plenty of quotes justifying presidents acting without the approval of Congress. So why is now any different, to them?" Where is the Republican plan? Republicans have gotten by with having no plan at all for lots of issues, but that is all changing fast (and will even more when they take control of the Senate in January). "Ask any Republican about what their plans are for immigration reform, and they'll always try to run out the clock talking about border security. Border security, secure the border, build a giant wall, put in a moat with alligators -- they fall all over themselves in a frenzy of one-upmanship. But they refuse to talk about anything else. Because they have no plan. What is the GOP plan for the 11 million people here? What should America do about them? Should they stay or should they go, and if so, how? The 11 million is a subject that Republicans just won't address in any way whatsoever, especially after Romney's 'self-deportation' idea went over like a lead balloon. But now that the president's acted, Republicans are going to be forced to deal with the question one way or another. What is the Republican plan for the 11 million? If they have one, I certainly haven't heard it yet. The president's got a plan, which he announced. What is the Republican plan? Anyone?" Keep these short and punchy. "Republicans in Congress need to do their job. President Obama has done his. If Republicans don't like it, then they need to pass a bill. Next year they will have absolutely no excuse not to, since they'll control Congress completely. So pass a bill! Where are the Republican plans for immigration reform? Write them into bills and pass them! Refusing to do so is no longer an option, if you want to stop Obama's actions. Instead of whining about Obama, how about Republicans actually do their jobs, for once? Pass a bill! Do your jobs -- Obama's doing his." This is deliciously ironic, so get all the amusement from it you can. "Republicans in Congress all wanted to use their famous 'power of the purse' to stop Obama's new immigration policy. They were going to de-fund the agency responsible for doing all the paperwork to implement Obama's new policy. There's only one problem -- the agency is entirely self-financed, meaning Congress has no control over their budget at all. The U.S. Citizenship and Immigration Services are funded by the fees immigrants pay. This was intentionally done by Congress so that taxpayers wouldn't have to pay one thin dime for the immigration service. No taxpayer money is used at all -- just filing fees from immigrants. It's pretty funny when you think about it -- congressional Republicans can't de-fund the agency responsible because they don't fund it in the first place. So what are Republicans going to de-fund? The whole Homeland Security Department, including the Border Patrol? I seriously doubt it." The Washington Post has a great look back through the ages at how many different presidents were on the receiving end of strikingly similar language. I was going to use this image anyway today, but have to tip my hat to them for being so thorough, rather than just looking for the earliest instance. The eyes and the hopes of the American people are anxiously turned to Congress. They feel that they have been deceived and insulted; their confidence abused; their interests betrayed; and their liberties in danger. They see a rapid and alarming concentration of all power in one man's hands. They see that, by the exercise of the positive authority of the executive, and his negative power exerted over Congress, the will of one man alone prevails, and governs the Republic. The question is no longer what laws will Congress pass, but what will the executive not veto? 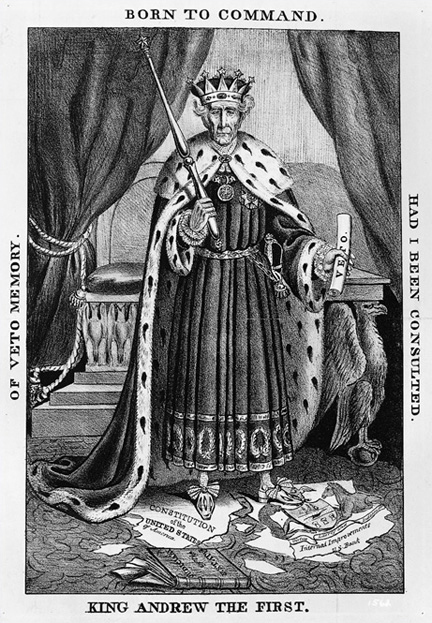 "In fact, the language Clay used in this speech was so anti-monarchical that the anti-Jackson faction coalesced into a new political party, which named itself for the most anti-monarchical party in England at the time of the Revolution: the Whigs. The very name Whig signifies what they thought of 'King Andrew The First.' In other words, tossing around terms like 'tyranny' and 'despot' and 'king' and 'emperor' is nothing new in American politics. Obama's got plenty of company, considering how many other presidents have had the same charges flung at them." Even if he had, we wouldn't do that to him on the week he had his birthday! "Happy Birthday, Mister Vice President..."
Sometimes, I can be a dog with a bone. Ahem. Enough with the "Reagan and Bush did it!!" meme..
Reagan and Bush merely tweaked immigration legislation that had been recently passed... The Simpson-Mazzoli Amnesty Law of 1986..
Obama's "move" seems to me more "inevitable" than "gutsy".... and not really a "move" at all, just (at last) standing firm against a fractured Republican majority without the will or means to strike a legislative bargain. What's a lame duck to do? Wield the power of executive orders and back it up with the veto. Powerful, but temporary in nature. The US Government is going ballistic for two more years. I don't mean ballistic in the sense of all the Republican Kubuki theater: hyperbolic Fox friendly rhetoric, meaningless resolutions, lawsuits and endless investigations. No, it's simply following a trajectory of governance completely determined by existing legislation. The controls are locked, at least until the 2016 election, but probably long after that. All Obama can really do is spin the capsule in pitch, roll and yaw. Anybody remember the Right Stuff? Good movie, great book. Is this point when most Americans, Blue, Red and Purple realize that we can't govern ourselves anymore? That our constitutional system produces something akin to the medical condition known as Parkinson's? Dare I say it? It's the Constitution stupid! Or the stupid Constitution. Ossification. If this be heresy, let's make the most of it. Before answering, let me first repeat that I have long been a fan of America and a true believer in the promise of America. Now, dare I say it ... it's the American people, stupid. Or should I say, it's the stupid American people. Of course, we could single out any number of countries in this regard but, for now, we're talking about America. One way to remedy this serious political problem that is the root cause of much of the political dysfunction might be for the enlightened people to start really fighting back and not be afraid of the truth. Do you like hard-working Mexicans? I do not like them, Obamaman. I do not like those Mexicans. Would you like them there or here? I would not like them to be here. I do not like them, let’s be clear. Would you like them in a jail cell? Would you like to tell them go to hell? I do not like them to have a green card. I do not care if they work hard. I do not want them here, can’t you see? I do not want them to get amnesty. I do not like them, Obamanman. Would you like them to self-deport? Would you like them if they can’t vote? Not with an anchor baby. I do not like them on our side of the wall. I don’t want to see them, no not at all. More of a totally moronic move..
And the MORON cherry on top is this POTUS saying, "I haven't changed my position on this"..
Is there any difference at all between what the president said he hadn't the authority to do and what he said he will now do by executive order? Nope, truth is completely irrelevant because it's subjective..
"If it's truth you're after, Professor Tyree's philosophy class is right down the hall." CW mentioned instances of "unitary executive" behavior coming from both bushes and reagan. pretty much any time ANY president does something that pushes a bit against the balance of power between branches, the response from the legislative side is to try to cast that executive as trying to act like a king. not that it's necessarily relevant to obama, but the charge of imperial president has been leveled the most at some of the presidents regarded as the best in history (Lincoln, FDR, Teddy Roosevelt). i would say FDR had the most imperial presidencey of all. CW mentioned instances of "unitary executive" behavior coming from both bushes and reagan. Which I have already proven is absolutely NOTHING like Obama did..
pretty much any time ANY president does something that pushes a bit against the balance of power between branches, the response from the legislative side is to try to cast that executive as trying to act like a king. And yet, there is no example of this that approaches what Obama did back 200 years.. Whaa?? The Left is allowed to get hysterical over it when a GOP'er does it, but approves when a DEM does it??? About the only contemporary "Imperial Presidency" that you can compare Obama to is Richard Nixon's Administration..
Joe Manchin, D-W.Va., Joe Donnelly, D-Ind. and Heidi Heitkamp, D-N.D. have all expressed concerns that Obama's actions are not good for the Democrat Party and not good for the country..
well, which is it? different or the same? or it's the same, in which case they all did it, are equally culpable for it, and are equally deserving of scorn. I don't mind that you disagree with me, but it gets confusing when your arguments conflict with each other in the same post. The redder the meat for Tea Partiers, though, the more it looks to the middle-of-the-road American like nothing short of petulance and whining. Are the yellow stripes and dead armadillos actually paying any attention at all? The presidency is too powerful. The Constitution assigns all powers to Congress. Article II literally doesn't have a section 8. The "unitary executive" nonsense is nonsense now, just as much as it was eight years ago. Part of the reason Congress is so dysfunctional is simply that it can be. As long as we're not hitting the debt ceiling or needing another continuing resolution to stave off the quasi-annual "government shutdown", Congress is free to gather up thousands of pages of its own poo, escalate to defe-con 1, and fling it across the aisle: no one will care. Everything is handled within the executive branch. Seriously, there really isn't any conflict in my positions. Bush didn't over-reach like Obama had done.. So, if Bush HAD over-reached like Obama, as the Left had accused Bush of doing then the Left is hypocritical for condemning Bush for the same thing that the Left lets Obama get away with.. Ya know, it's rather ironic..
it's still self-disproving. you're saying that what obama and bush did were different. so unless democrats are somehow compelled to judge presidential actions by your priorities rather than their own. they're entitled to get upset about one set of actions and you're entitled to get equally upset about another. therefore, based on your own statement, hypocrisy from the Left in this case would require a condition other than reality. thank you for clearing that up. therefore, based on your own statement, hypocrisy from the Left in this case would require a condition other than reality. The Left lives in their own little world that is far divorced from reality... And, in that little world, Bush and the Right are pure evil incarnate and Obama walks on water and Democrats are as pure as the driven snow.. There was a discussion in a previous commentary as to whether Obama's over-reach was based on a real need or based on politics.. It is undeniable that Obama's case for action would have been a LOT stronger if Obama had waiting and given the new GOP Congress a chance to get things done..
Can't wait to read Hagel's tell-all memoirs.. I wouldn't hold your breath on that one, Michale, if I were you. I don't think he's the type. Many said the same thing about Panetta... If such a stalwart and loyal Democrat like Panetta was driven to expose the Obama frustration, I doubt Hagel will be able to resist.. I can't say that I'm very surprised that Secretary Hagel is leaving the Pentagon. I think the reasons have much to do with his communication skills, or lack thereof (ironic, indeed, considering the ineffectiveness of President Obama, himself, in this regard), and with the fact that Hagel may not have the right personality to be effective as head of the Defense department. But, make no mistake about it, Chuck Hagel is one of America's great public servants, a class act, all the way. If more Republicans were capable of the kind of enlightened analysis that always characterized Hagel's positions on the issues - whether you agree or disagree with his stance on any single issue - then I am sure that there would not be the level of dysfunction that is so pervasive through all levels of leadership in Washington. Finally, I would say that Chuck Hagel and Leon Panetta are not made from the same stuff. And, that is why I am so sure that you will not be delighted by Hagel's memoirs, should he ever go that route. I can't say that I'm very surprised that Secretary Hagel is leaving the Pentagon. Just to make sure we are operating from the same set of facts.. But a military leader that puts too much faith in diplomacy is easily manipulated.. I will say this, though, Obama's inner circle may be at the root of most of his problems, politically speaking and policymaking-wise. For a leader to be effective, they need to surround themselves with people who will tell him/her how frak'ed up they are. Only then can a leader make sound decisions.. Seriously, Vice President Biden has always been one who has eschewed politics-as-usual and any sort of political shenanigans and I think he, perhaps more than anyone else in this administration, has been frustrated by the workings of Obama's inner circle. It's a foregone conclusion.. There is simply no way in the universe that Wilson will be indicted.. But, make no mistake about it, Chuck Hagel is one of America's great public servants, a class act, all the way. While I disagree with Hagel on many things, it's the fact that he IS an honorable public servant is exactly why Obama forced him out..